Every youth in Scouting deserves a trained leader! An adventurous and fun Scouting program will grow and keep youth and their families engaged….. but only with enthusiastic volunteer leaders who are armed with the tools and knowledge to deliver a program of excellence. Our boys deserve nothing less! Staple the printed Youth Protection completion certificate to new adult applications. Request all volunteers to complete the e-learning modules for their position. Request volunteers to complete Youth Protection annually before charter renewal. Request any volunteer changing leadership roles to complete training for their position. Every Volunteer should ENTER AND SAVE their membership identification # into their my.scouting.org training portal. Troop Committee members should complete the E-learning Troop Committee Challenge and Boy Scout Fast Start at my.scouting.org. Register new troop volunteers as a member of the Troop Committee. Don’t register as an Assistant Scoutmaster until completion of Scoutmaster Specific and Outdoor courses. ASK new Cub Scout volunteers to complete their E-learning modules at my.scouting.org. NEW training modules for Cub Programs have been updated. What can your unit do now to become a 100% Trained Unit? Questions? Contact your district training chairman, or your District Executive. Cub Scout Leader Specific Training: Each Cub Scout leader completes the specific course for their specific position in the program. These courses are: Cubmaster and Assistant Cubmaster; Pack Committee Chairmen and Members; Tiger Cub Den Leaders; Cub Scout Den Leaders and Assistants; Webelos Den Leaders and Assistants. These include materials of pack organization, advancement, den and pack meeting program planning, and your role within the pack. The leader is considered trained upon completion of This is Scouting and the Leader Specific training for that position. This level of training is required for all Cub Scout Leader awards. Boy Scout Leader Specific Training: Each Boy Scout leader completes the specific course for their specific position in the program. 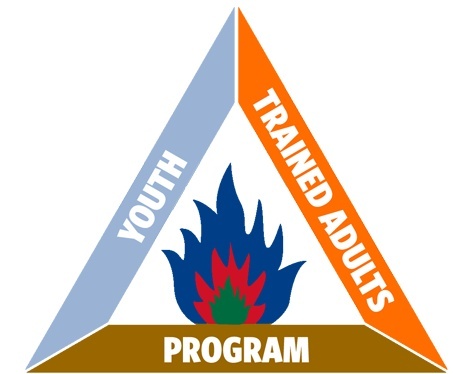 These courses are: Scoutmaster and Assistant Scoutmaster; Troop Committee Chairmen and Members. These include materials of Troop organization, advancement, Patrol and Troop meeting program planning and your role within the Troop. The leader is considered trained upon completion of This is Scouting and the Leader Specific training for that position. This level of training is required for all Boy Scout Leader awards. Pack & Troop Committee: Each Committee Member should complete this course so that they will know how a committee should operate. BALOO Training: This training is required for Cub Scouts to be able to camp. Without this training a pack is not allowed to camp. Boy Scout Outdoor Training: This Training is designed for Scoutmasters, Assistant Scoutmasters and Troop Committee. To help Leaders to prepare and train scouts to be prepared for camping in the outdoors. Trainers’ EDGE: This course is designed to train trainers to train. NYLT: National Youth Leadership Training. This course is the “Wood Badge” for Boy Scouts. It is designed to develop and train boys to be the best possible leader they can be. University of Scouting: An opportunity to take your training to a whole new level. Over 30 supplemental training courses offered for everything from low cost camping to working with scouts with disabilities.